When powerful thunderstorms battered Chicago and knocked out electricity to 900,000 Commonwealth Edison customers in July 2011 -- the worst of several storms that year -- the fallout prompted the Midwest's largest utility to solicit ideas from employees to do service restoration more quickly. One of the ideas that emerged will get the first real-world test this summer: miniature flying machines equipped with cameras to help identify the exact location and the extent of damage when there's trouble on the grid. The utility in February received Federal Aviation Administration approval to use unmanned aircraft systems, better known as drones. Along with its partners at the Illinois Institute of Technology (IIT), ComEd will deploy the systems to help crews identify the damage. "It's always a challenge during a storm to get accurate reports on the extent of the damage," Terence Donnelly, ComEd's chief operating officer, said in an interview. "It's critical information for crews that need that to get repairs expeditiously." ComEd, which distributes electricity to 3.8 million customers across 11,400 square miles in Chicago and northern Illinois, became the first utility to receive approval to use drones on an operational basis. San Diego Gas & Electric, Southern Co. and NextEra Energy Inc. have all gotten FAA approvals in the last month, according to the FAA's website. Other utilities -- Arizona Public Service Co., Consumers Energy and Xcel Energy Inc. -- have requests pending. SDG&E last summer received FAA approval to test drones in a rural area near San Diego County (EnergyWire, July 14, 2014). Donnelly said the use of drones by utilities is not a one-off fad, but part of a broader trend in which new technologies are being deployed and tested to make the power grid increasingly resilient. In a separate project with the Georgia Institute of Technology, ComEd is also exploring the use of robots to see inside manholes and underground vaults before sending in employees to do repairs. Throughout a dense urban environment like Chicago, much of ComEd's infrastructure is underground. Researchers at the Illinois Institute of Technology will use drones like this one, which are modified with a rolling cage, to help Commonwealth Edison begin inspecting electrical infrastructure near Chicago this summer. ComEd is the first utility in the nation to get Federal Aviation Administration approval for operational use of unmanned aircraft systems. Photo by Matthew Spenko, courtesy of the Illinois Institute of Technology. ComEd sees storm damage assessment as one of two primary applications for drones, particularly in hard-to-access areas where lines stretch along railroad tracks or over farm fields. Currently, such areas require inspection by off-road vehicles or by foot. "We see some real opportunity to cut large amounts of time from that process," he said. Another key use is line maintenance -- surveying for potential problems before the lights go out. ComEd plans to equip drones with infrared cameras to detect hot spots on electrical lines, which could be a precursor for line failure. For its 5,000-plus miles of high-voltage transmission, the utility currently does inspections via helicopter. Years from now, though, drones could be an alternative. In the meantime, unmanned aircraft could be used to patrol smaller distribution lines that have more of a direct impact on outages, Donnelly said. To the extent that time is money, drones could also yield cost savings. Donnelly said ComEd hasn't come up with an estimate of possible savings yet, but the utility will develop a better idea of the potential after field trials this summer in Chicago's south suburbs. "We saw it as a pure efficiency play to improve service, to get damage assessments faster and more accurately, so we can get storm restorations done more quickly," Donnelly said. The trials will rely on a team from IIT. And flights will initially be subject to FAA restrictions on where and how they operate. Flights must avoid heavily populated areas and airports. 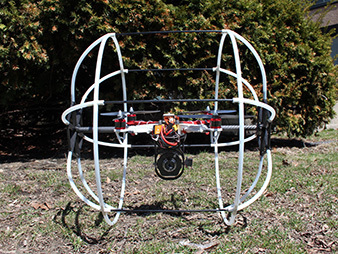 Matthew Spenko, an associate professor of mechanical and aerospace engineering at IIT, said drones being deployed by IIT and ComEd are off-the-shelf DJI S900 systems that have been modified with cages that will allow the systems to roll as well as fly. The reason for the modifications: efficiency. In the air, the drones can operate about 10 to 15 minutes. Moving between assignments on the ground could significantly expand battery life, Spenko said. "The hex-rotors and quad-rotors are notoriously inefficient when it comes to flight," he said. The systems being used by IIT are larger than many drones at about a meter in diameter and up to 18 pounds that allow them to carry cameras able to send real-time high-definition video. They'll come with a crew of two -- a pilot and separate camera operator. By contrast, the drones used by SDG&E measure just 16 inches in diameter and weigh less than a pound, according to a release from the utility. Officials at ComEd and IIT researchers will be watching this summer's field trials closely and gathering data, with an eye toward expanding the drones' workload. "What we want to find out is what happens when we take this out into a real-world situation," Spenko said. It's even possible that ComEd could end up owning and operating its own fleet of unmanned aircraft. Donnelly said: "We have to develop our thinking in this area, but we think that's possible to have a fleet of the equipment because it would be so integral to improving service."